Why Can't I Open Vista's Cookies Folder? NOTE: This column was updated on September 16 to correct an error. logon\cookies. Except that the Cookies folder isn't there. What is there is a pointer that tells Vista where the real cookies folder can be found. Since Vista doesn't believe you should be privy to this information, it tells you it's not accessible. 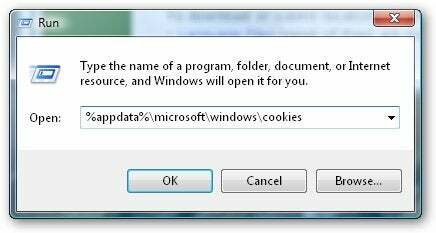 The right command will bring up your cookies folder even if Vista doesn't want you to. then press ENTER. That should take you to the real Cookies folder. Once you've found it, you can make it easily accessible: Hold down the right mouse button while you drag the Cookies folder icon from Windows Explorer's Folder pane to the desktop, the Start menu, or some other convenient location. When you release the button, select Create Shortcut Here. For more on cookie care, see Block Spying Cookies, but Keep the Helpful Ones.